Barbara Fisher was born in New York City, educated in Colorado and California, and lived for many years on the West coast before settling in Asheville, North Carolina in 1998. 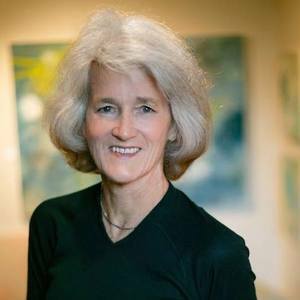 Her work has been exhibited in solo shows throughout the country, including the de Saisset Museum (CA), Bank of America World Headquarters (CA), The National Institutes of Health (MD) and The Washington Cancer Center (DC) as well as in many galleries. Her paintings have hung in group shows at the Asheville Art Museum (NC), the Alexandria Museum of Art (LA), the Sun City Museum of Art (AZ), the Chicago Cultural Center (IL), Highlands Museum of the Arts (FL), Hickory Museum of Art (NC), and the Mobile Museum of Art (AL). Fisher has received numerous grants and residencies including the Mortimer Fleishhacker Foundation Grant (CA), Asheville Arts Council Project Grant (NC), the Ucross Foundation (WY), and the Ragdale Foundation. Her work can be found in the collections of Capital One (VA), Western NC University Art Museum (NC), the Asheville Art Museum (NC), First Charter Bank (NC), Bank of America (CA), National Institutes of Health (MD), University of NC Hospitals (NC), Mission Hospital (NC), the Coweta County Public Library (GA), the Electrolux Corporation (NC) and the Foundation for the Carolinas (NC).